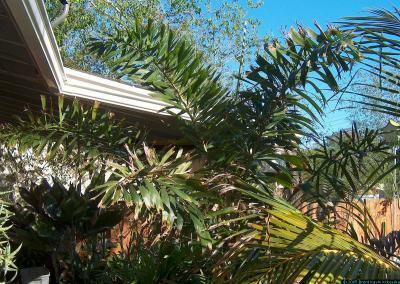 The foxtail palm is a great plant. I've grown this one for years in my houses and apartments with no sun at all, and outside with full south Texas sun. I almost lost it once when a worm of some kind set up housekeeping behind an old dead leaf against the trunk. It made quite a bit of damage that took the plant a year to recover from, but it's doing great now. I give my Wodytia lots of food and water and it grows fast for a palm tree. Wodytias are becoming common as landscaping plants down here because they can withstand lots of wind and mild freezes. If you protect them from wind the leaves are very long and graceful looking, and packed with nicely formed leaflets evenly spaced around, which is why it's called a foxtail palm. In the wind, it gets a more hardened, craggy look. Much like myself.